Perhaps the best known tracker in NSW is Alexander (or Alec) Riley, who worked, mainly at Dubbo, from 1911 to 1950. His tracking feats were respected by the white and Aboriginal communities, and in 1943 he was awarded the King’s Police and Fire Services Medal for Distinguished conduct. He was also the first tracker to be promoted to the rank of Sergeant North-Western Watchman 7 January 1943:2.. The cases on which he worked are too numerous to mention, but some of the best known include the following. In June 1923 he helped pursue and capture Roy Governor (youngest brother of Jimmy Governor) at Mendooran. Nine years later, Alec took two days to track the murderer of 92-year-old Jack Hewitt who had been battered to death at Gilgandra. On Christmas Day 1940, he was called in to look for Desmond Clark, a two-year-old boy who had gone missing from his home at Bugaldie. Alec had definite ideas about where to look but the police called off the search. It was not until seven months later that Riley was recalled to the scene and the boy’s body was found in a wash-awayDubbo Liberal 12 June 1923; North-Western Watchman 7 January 1943:2..
His other duties at the Police station included looking after the horses and collecting prisoners off the train. Alec took the horse drawn “Black Maria” for the latter job. He was dedicated to the job and continued to work on the occasional case for the Dubbo Police after his retirement. Aside from police duties, Alec was a keen footballer and a fine athlete. He coached children in athletics at Dubbo for many yearsDubbo Mailbox Shopper 6 December 1995; Hodder 2003..
Alec Riley was born at Nymagee in 1887 to John Riley and Mary Nolan. His parents came from the Lachlan River. Alec said that he learned his tracking skills from the old blacks living on the properties near Nymagee. Family members have said he was also taught by men from CondobolinInterview with Bernadette Riley at Dubbo, 10 March 2015.. He married Ethel Taylor, an Aboriginal woman from Dubbo, at Wellington in 1910 and together they had eight children. One of his children, Allan Riley, married Dorothy May Wright, the daughter of another tracker, Reuben WrightMC 1953/00962.. While working at Dubbo, Alec lived most of the time on the Talbragar Reserve to the north of town. He continued living there after retirement, saying that he did not wish to face the “rat race” of the town itself. 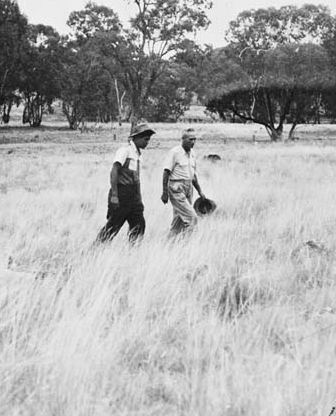 One of the last people to leave the Talbragar Reserve in the late 1960s, Alec Riley died in Dubbo on 29 October 1970. The police gave him full honours at his funeralDC of Alexander Riley 1970/38003..
Alec Riley is still fondly remembered in Dubbo today. In June 1997, Riley’s grand daughter, Kathy Green, and the Minister for Roads, Carl Scully, opened a cycleway along Macquarie River named in his honour. His family regard the cycleway as a just and timely tribute for a man who did not always receive the recognition he deserved during his lifetime. In 1996, his grandson, Michael Riley, filmed a documentary for the ABC about his life which reconstructed several of his most famous casesDubbo Mailbox Shopper 25 June 1997; Dubbo Liberal 26 October 1996..
1. ↑ North-Western Watchman 7 January 1943:2. 2. ↑ Dubbo Liberal 12 June 1923; North-Western Watchman 7 January 1943:2. 3. ↑ Copy of NSW Police correspondence held by Bernadette Riley. 4. ↑ Dubbo Mailbox Shopper 6 December 1995; Hodder 2003. 5. ↑ Interview with Bernadette Riley at Dubbo, 10 March 2015. 7. ↑ DC of Alexander Riley 1970/38003. 8. ↑ Dubbo Mailbox Shopper 25 June 1997; Dubbo Liberal 26 October 1996.